When you recall how thoroughly public confidence was shaken during that last financial meltdown, you probably also remember how reluctant most people were to presume that Utah County real estate values would rebound anytime soon. Those who saw nosediving property values as nothing less than a great buying opportunity were in the courageous minority—even though a cool-headed review of the history of home values’ ups and downs made such a conclusion pretty safe. Today there may be a similar Utah County real estate opportunity—although, in truth, you have to look a lot harder to see it. It’s emerging in the realm of Utah County rental real estate investments. Instead of resulting from a dramatic global financial shakeup, it’s the by-product of a less headline-grabbing phenomenon—namely, an emerging shift in American lifestyle and spending habits. One piece of evidence can be found in the rapid adoption of “sharing economy” businesses like Airbnb and Uber. Forbes magazine points to their ascendency as evidence of a shift in Americans’ willingness to share goods and services with others—as well as a new attitude about ownership in general. It’s most evident among the younger set: “A fifth of Millennials would consider renting DIY products, clothing or sporting equipment,” one survey found—key drivers being affordability and convenience. Meantime, the widely-respected Pew Research Center found particularly that steep declines in homeownership are only partially due to the difficulty of coming up with a down payment. Even though mortgage approval rates are up, home loan applications are down. This impact such an attitudinal shift could mean is underlined when you realize that there are 92 million Millennials. They make up the largest generation in American history. If they continue to place more value on the flexibility and convenience provided by the new business models, another outcome could well be the disappearance of the stigma that used to go with renting. Per the Urban Institute’s Laurie Goodman, the dip in homeownership among younger generations “is a permanent shift”—one evidenced by the rise in “lifestyle renters” (those who can afford to buy, but choose not to). It could be part of why the rental market is booming across America—and lead to the conclusion that it will become, as Goodman stated, a permanent trend. If so, the long-term implications are certainly positive when it comes to Utah County rental real estate investments. 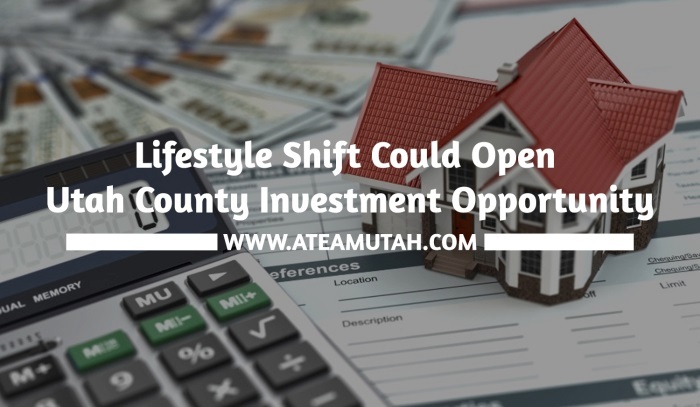 For anyone who has ever considered diversifying into a Utah County real estate rental property investment, now would be a great time to call me to investigate further!